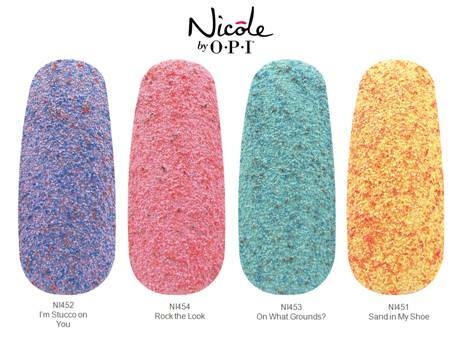 This March, Nicole by OPI launches Roughles (“ruffles”) — 4 new textured nail lacquers featuring speckled, pastel shades of purple, pink, turquoise and yellow. When the lacquer dries, Roughles lacquers reveal a unique pebbled finish. Roughles should be applied without a top coat to achieve a matte effect. I terra-“cotta” have this textured purple on my nails! The edgy side of girlie…a textured pink all your own. Stop in the name of this textured turquoise beauty! I “beacha” just love this grainy golden yellow in me. Nicole by OPI formulas are long-lasting, fast-drying, and salon-quality. 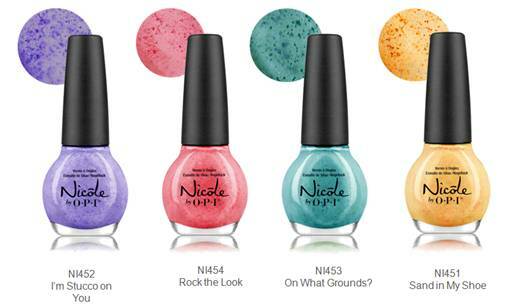 The 4 new nail lacquers will be available in stores beginning March 2014 for $10.99 each at select Shoppers Drug Mart, Walmart Canada, Jean Coutu, Loblaws and London Drug. For more information, visit Nicole by OPI on the web, on Facebook, on Instagram and on Twitter!